Today’s recipe is brought to you by Simply Organic and Stonyfield, and we’re whipping up a quick holiday appetizer using some great ingredients from both brands. 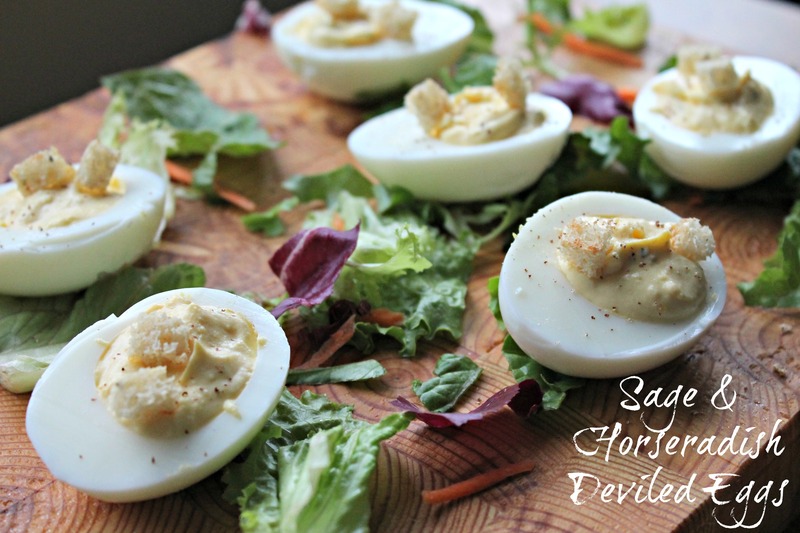 These Sage & Horseradish Deviled Eggs will be a sure hit at your next party! When making holiday appetizers for dinner parties and get togethers, we can go two ways: the extremely complicated appetizer that has a million ingredients and steps OR the super easy appetizer that still just as flavorful! Over at our home, we tend to go with the latter, keeping things simple and delicious. And what’s better than deviled eggs? An all-time favorite, this classic recipe is revamped with organic spices from Simply Organic and tangy greek yogurt from Stonyfield. 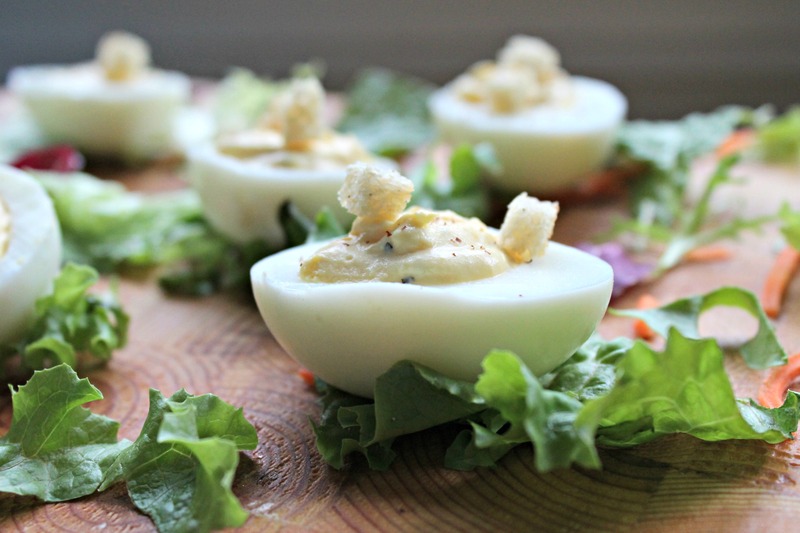 Topped with tiny croutons and a sprinkling of spiced nutmeg, these deviled eggs are irresistible! Working with both companies makes me feel proud of what I do as well as makes me feel safe regarding what I put on our plates. Thanks to both Stonyfield and Simply Organic, we’re hosting a fun giveaway just in time for the holidays! Check out the recipe and giveaway below! To hard boil eggs: place eggs in small saucepan and cover with cool water. Over high heat, bring eggs to a rapid boil. As soon as the eggs boil, shut the heat off, cover the eggs, and set a timer for 12 minutes. Once cooked, remove from water and peel. Cool eggs before making recipe. Slice eggs in half, lengthwise and remove yolks, placing them into a small bowl. Mash together with yogurt, sage, thyme, horseradish, and salt. Fill the whites with the yolk mixture, top with a sprinkling of sage and tiny croutons. Serve chilled over mixed greens. To make tiny croutons: slice bread into small squares and toss with olive oil. Toast in 350F oven until crispy. 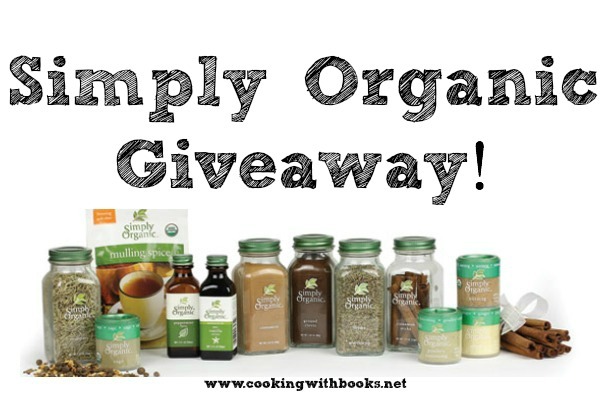 Disclaimer: This giveaway is sponsored by Stonyfield Farms and Simply Organic Foods. Garlic! This time of year I like to use cinnamon a lot as well. I probably use cumin & garlic the most. I found a ground jalapeno powder and I love using it. Garlic salt! A close second would have to be the Cajun spice mix. five spice! i can’t get enough of it! I absolutely love Simply Organic’s garlic powder! It actually tastes like garlic unlike so many others. I use cinnamon all the time! I love garlic and cinnamon! I love almond extract… and nutmeg. I love Vanilla and cinnamon. I love cardamom.. a lot! I love to cook with curry! At this time of year, cinnamon, sage, and rosemary are my top 3! Without cumin I would be lost. Also having a love affair now with smoked paprika. I love garlic, basil, cinnamon, nutmeg. oh my i can’t pick just one. I use garlic salt and powder and cinnamon the most ! Great giveaway, friend! I <3 cumin. And cinnamon. And nutmeg. I love garlic powder and basil!